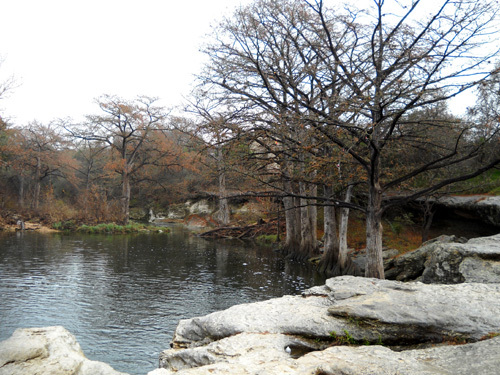 biking, hiking, fishing, and camping beneath towering cypress on the banks of Onion Creek . . ."
The Old Three Hundred . . . 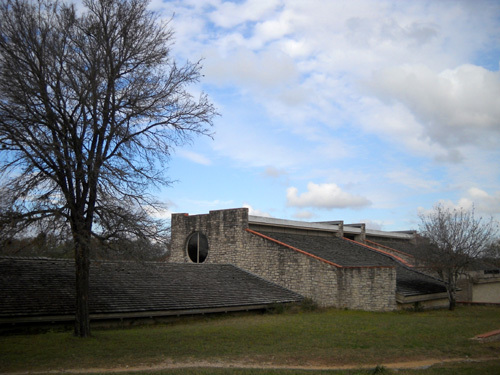 I've learned a bit of Texas history to share with you! 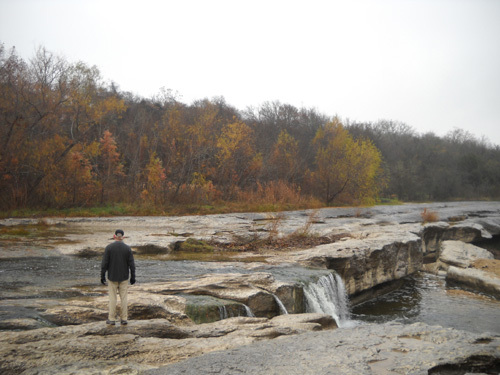 After reading the description above of McKinney Falls State Park, I just had to do a quick internet search to see what "The Old Three Hundred" was all about. Briefly, the term refers to the original settlers who received land grants for the first Anglo-American colony in the area, which was under Mexican control in the early 1820s. Stephen Fuller Austin, for whom the city of Austin was later named, hand-picked individuals and families from the South, mostly Louisiana, to farm or raise livestock on large plots of land in central Texas that had never been claimed by either Spain or Mexico. A total of 297 titles were granted under the original contract -- almost 300. Because of the large interest in the project and the limited number of titles available, Austin could be very selective in his choice of immigrants. He wanted homesteaders who he thought would be industrious and stable. As a result, almost all of the settlers were literate and belonged to a higher socio-economic class than the majority of the folks who were willing to colonize western lands in the early 19th century. Apparently the project was successful. 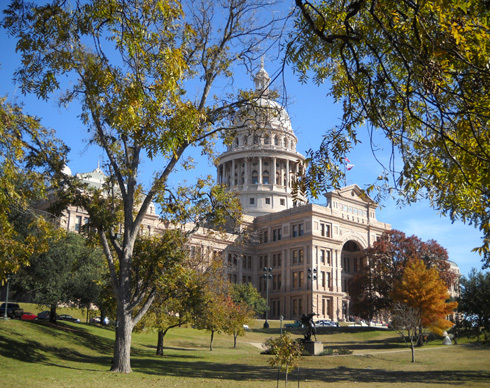 When Texas gained statehood a few years later, the city of Austin became the state capital -- twice, in fact. Sam Houston wasn't too fond of having the capital in Austin and he moved it to (you guessed it) Houston. He was finally overruled in 1850 and Austin has been the state capital ever since. History was never one of my favorite subjects when I was in school. Oh, most of it was interesting but there were so many facts to remember! I memorized them well enough to ace all my history courses through the end of high school, but promptly forgot most of the dates and people and places when I went off to college and grad school; I didn't need any history courses for the degrees I earned and I just didn't see how history was relevant to the career I pursued. Funny thing, though: when I began traveling in my early twenties, one of the most fascinating things to me was learning the history of the areas I was visiting! It was a whole lot different when I was in the actual place where something interesting happened. Obviously, "history" is about much more than who, what, where, when, and why. It was the who-what-where-when that I wasn't so interested in; I've always remembered the main concepts, the "why's" of significant events. And for the last forty years, even the who-what-where-when has appealed to me when I'm visiting an area for the first time and it has a rich history. So it is with our trip to Austin. I'm as interested in absorbing knowledge of local culture and history as I am in exploring the trails, parks, and streets, photographing the wide range of architecture, learning about the transitional eco-zone between prairie and desert, visiting museums and prominent buildings, checking out stores and restaurants unique to the area, and other touristy pursuits. When we chose to make reservations at this park several months ago we did it primarily because of its proximity to a race we thought we might run. The description in the state parks guide and on the internet was a close second: "bucolic retreat," "miles of woodland trails," "popular with hikers, cyclists, and campers," "serene beauty," "abundant wildlife." Ahhh . . . 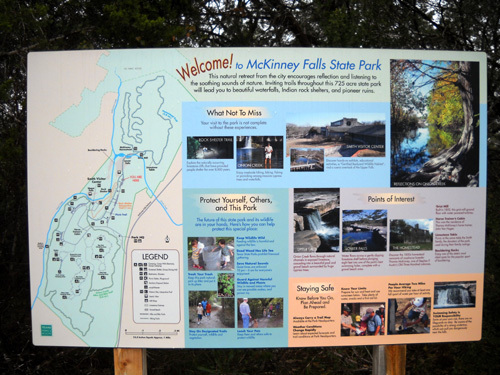 In addition to reading about the park on the internet before our arrival, another good way for us to learn about the history of McKinney Falls' 744 acres was to browse the interpretive displays at Smith Visitor Center. We did that soon after settling into our campsite. Both the entrance office and the visitor center also have lots of brochures and pamphlets with trail maps, information about the flora and fauna in the park, interpretive programs led by the rangers, and the cultural and geographic history of the area. In addition, there are signs placed around the park that describe its special features. 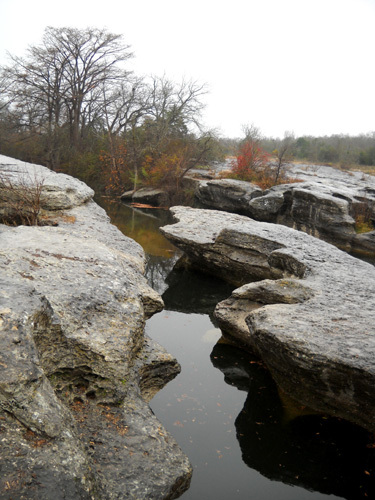 Rocks play a major role at McKinney Falls. Fortunately, most of them are not on the trails, waiting to trip me up. The trails we've seen here are quite tame. 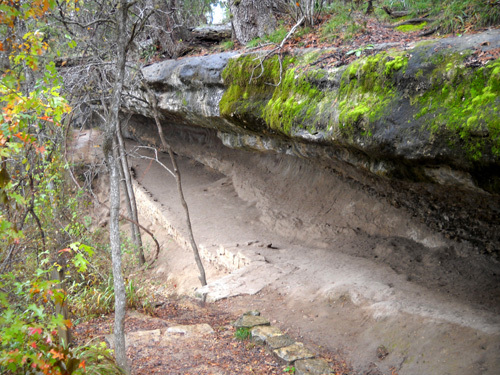 According to a display at the park, archeologists have determined that small groups of hunting and gathering peoples lived here from 500 A.D. to the late 1700s. Other sources say nomadic groups may have occupied the area for over 5,000 years. 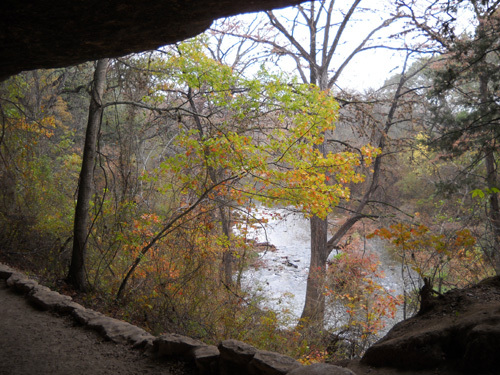 The last known occupants were closely related to the Tonkawa tribe. Here's a second link to that group. 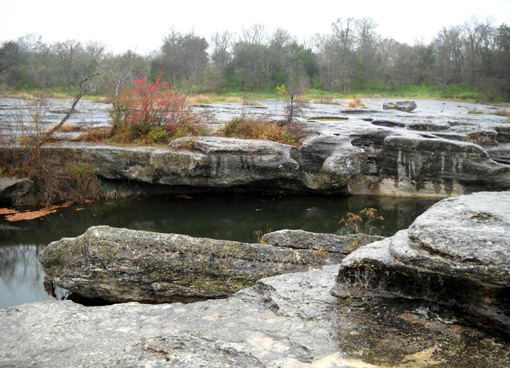 McKinney Falls is a popular place for the sport of bouldering. 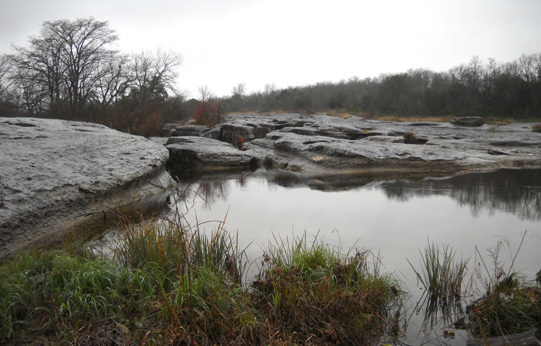 Millions of years ago sediments from an ancient sea that covered much of Texas solidified into limestone bedrock. Later, an extinct volcano spewed softer debris over the bedrock. 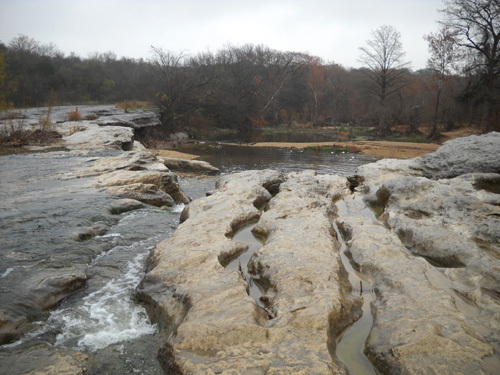 The volcanic material and limestone have eroded over the eons to form the two major falls in the park and other interesting rock features along Onion Creek and the trails. The two main falls are the highlight of the park. Even though it has been raining in the area quite a bit this month we haven't seen the falls as high as the photo in the state parks book. They are pretty cool nonetheless. 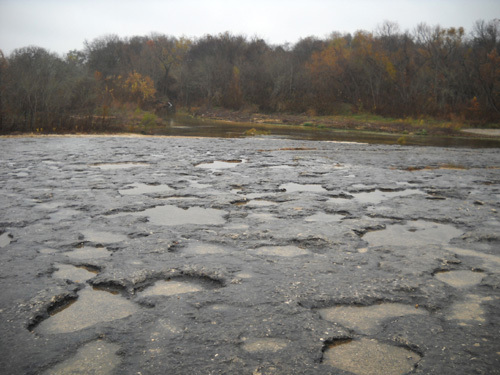 You can see how water has eroded the volcanic rock and limestone into some interesting patterns. 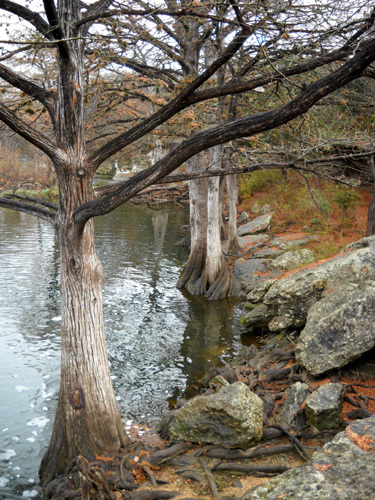 Bald cypress trees line the banks of the pool below the Upper Falls. The other plate was behind a tree a couple feet to my right and I didn't get a picture of it. Although I hadn't seen anyone near, I was so surprised that I felt like someone must be watching (remember the old TV show "Candid Camera?"). I was as discreet (stealthy?) as possible. 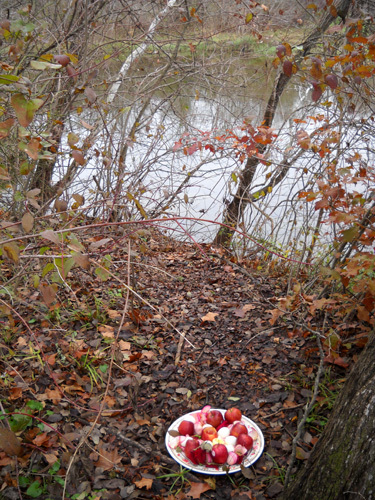 My first thought was that someone left the apples and eggs for the deer or other wildlife. But why would they leave it on two nice dinner plates? And why roses? Then I realized there was a small, burning candle in the center of each plate. They'd obviously been lit only a few minutes earlier. I looked around again, feeling like I was trespassing on a sacred site and wondering if the person who left the plates was watching. I still didn't see anyone. This was apparently an offering or memorial of some sort. I took one quick photo and turned back to the trail. Cody and I hiked up the hill to the visitor center to see if one of the rangers knew what I'd found. The door was locked in the middle of the afternoon. Rats. I'm still wondering. I'll have to ask another day. One guess is that two people drowned nearby. 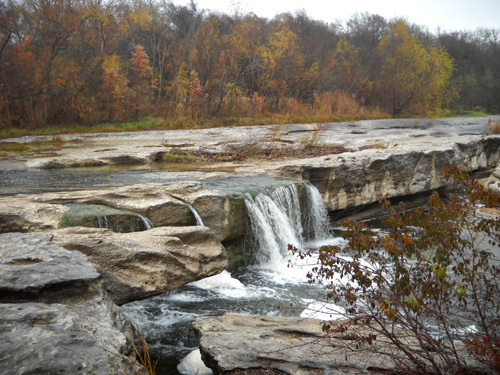 The rocks and pools of water above and below both falls are popular recreational spots during warm weather. 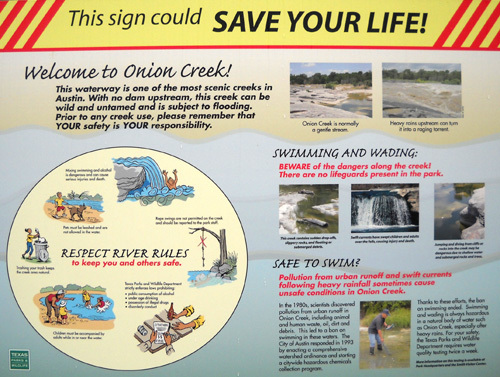 There are big warning signs (above) that wading or swimming in Onion Creek can be quite treacherous because of slick and hidden rocks, sudden drop-offs, floating debris, swift currents, flooding, pollution, and other hazards. Several people have died when they've been swept over the falls. Visitors cross this large bedrock area to reach the falls but Jim and I didn't realize that the first time we were nearby. We were hunting for the Homestead Trail loop that day and went to the right of the rocks, following a dirt road. When it dead-ended and we couldn't find any other trail across the creek, we came back, found the falls, and realized that we'd have to cross the wide creek at or above the falls to reach the trails on the other side. and the current was strong when we were there. Crossing would be more fun on a hot summer day! 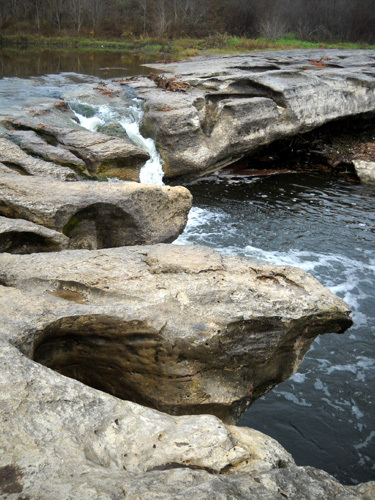 More interesting erosion; beyond the falls is another pool of water popular for swimming. Jim considers crossing farther above the falls. Our decision: maybe next time we are here. WHO IS McKINNEY, THE PARK'S NAMESAKE? Thomas McKinney was one of Stephen Austin's "Old Three Hundred" homesteaders that I talked about at the beginning of this entry. 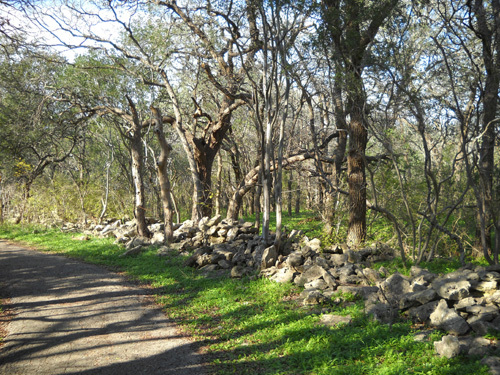 During the 1820s McKinney purchased a nine-league land grant -- almost 40,000 acres -- at 10% of what comparable acreage sold for in the United States (remember, Texas was under Mexican control then). Ten percent was only 12�� per acre! Imagine that. 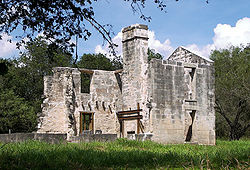 McKinney was a prominent businessman who became a Texas revolutionary figure. 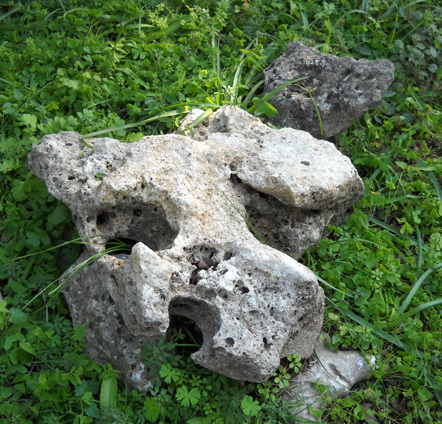 He also helped to found the city of Galveston. 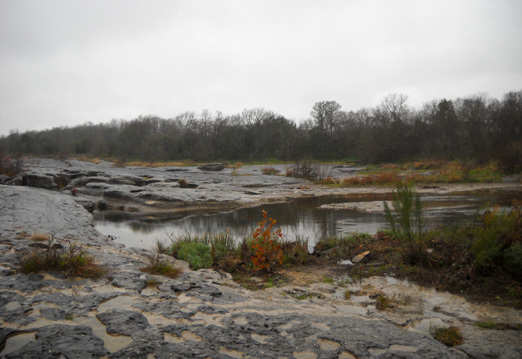 He sold most of his land before settling on the property which is now McKinney Falls State Park in 1839. There he established the area's first flour mill and raised thoroughbred horses. 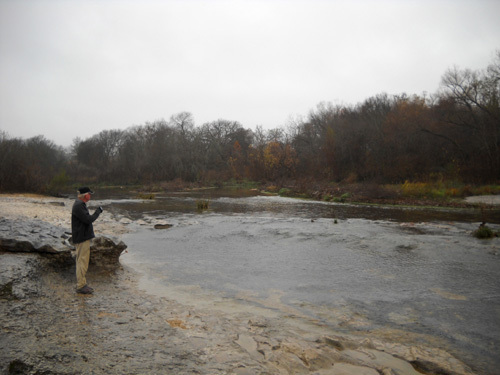 Unfortunately, Jim and I haven't been across the creek yet to see the house or gristmill -- or lots of miles of single-track trail in the northern half of the park. Why? Because the only way park visitors can get there is to ford the creek. 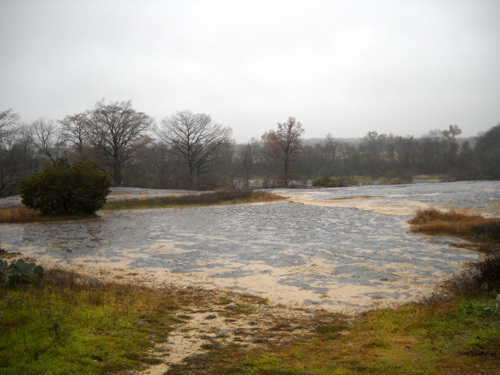 Park staff can use service roads out of the nearby state park headquarters property, but visitors aren't allowed to cut through that property. Now we have no qualms about fording most creeks, but this one is running high, wide, and very slick after all the rain Austin has had since our arrival last week. If it recedes enough before we leave on Friday, one or both of us may venture over there. 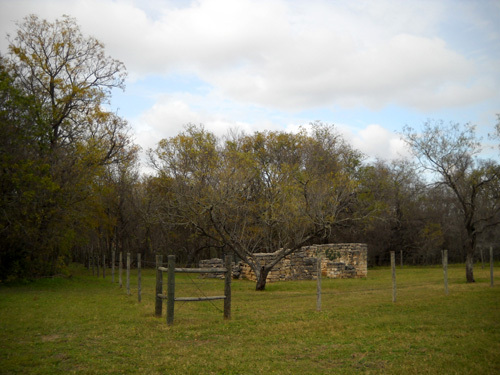 It's a lot easier for visitors to see the remnants of a two-room cabin (below) occupied by McKinney's horse trainer, John Van Hagen -- the main park road passes in front of it. 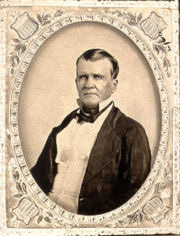 McKinney and his wife Anna had no heirs. In 1885 they sold the property to James W. Smith. I don't have any information about how the Smiths used the land or where they built their house. 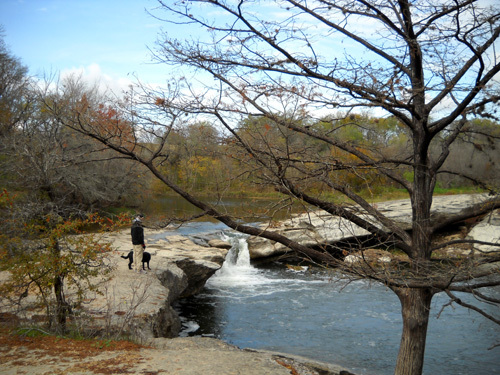 However, in 1971 Smith's grandson Pete donated 682 acres of the property to the state for what is now McKinney Falls State Park. The park opened five years later. 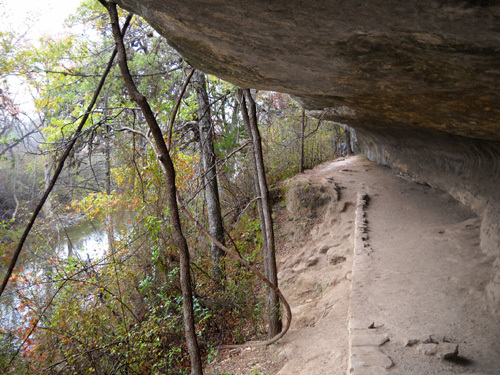 The visitors' center and large rock shelter are named after the Smith family. 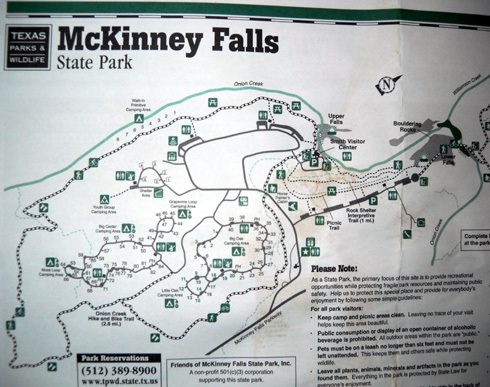 Seems to me the park and falls should be named after the Smiths for their generous donation, and the visitors' center and rock shelter after the McKinneys! We much prefer public parks over private ones because they have larger sites and are usually more natural. They are also usually cheaper because they don't have all the amenities many private RV campgrounds have, amenities we probably won't use. Public parks and lands can have their disadvantages, though: too often we have problems finding suitable sites for our medium-sized rig, a 32-foot 5th wheel. The roadways may be too narrow, have tight turns, or low branches. The sites may be too short for our camper + truck, or too narrow for slide-outs. Even at one of our favorite state parks, Huntsville (TX), there are only a few sites we can use. Every time we make reservations there, we know we run the risk of not being able to find a suitable site. But at McKinney we can fit into 75-80% of the sites. So can Class A motorhomes and 5th wheels or trailers that are longer than ours. Most of the sites are back-ins; about a quarter are pull-thrus. We chose a back-in site this week so we'd be farther off the road. All of the sites have water and electrical hookups. Each loop has two clean bathrooms with showers. Only the campground hosts have sewers (that's common in public campgrounds); everyone else can use the dump statioon on their way in and/or out of the park. Since we're here for just a little over a week, we've been using our own toilet and shower. We dumped our gray and black water tanks when we came in and we'll dump them when we leave. If we were here for the maximum of two weeks (longer if the park isn't full) we'd have to either use the restrooms part of the time or move the camper a mile to the dump after 10-12 days. Some people use "blue boys" (plastic tanks on wheels) to carry their waste water from their RV to a dump station, but we've never gotten one of those. 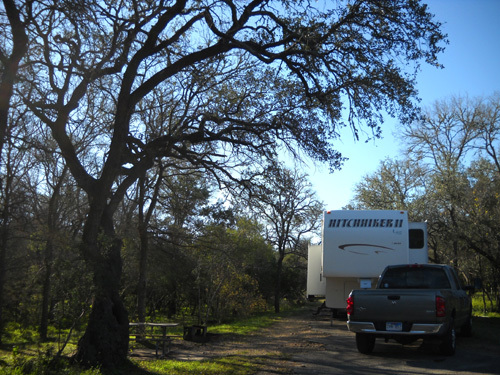 Like many Texas State Park campgrounds, the sites at McKinney are only $16 per night. There is no reduced weekly fee here like there is at Huntsville in the winter (seven nights for the price of six). However, our state parks pass covers the $5/day per person cost of entry into the park.